This was a great weekend for two new Iowa County, Wisconsin food businesses. First up... Acala Farms in Barneveld. 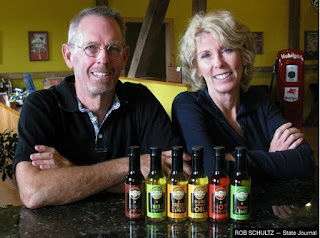 Our friends Sarah and Peter Botham recently launched a new venture, Acala Farms, to introduce beautiful, flavor-infused cooking oils made from cottonseed. Stop at Botham Vineyards and Winery in Barneveld, WI for a tasting. "The oils can be drizzled on pasta, vegetables, popcorn and salads. They also can be used as dipping oils in the same fashion as olive oil. 'It adds flavor to everything you can think of. It's a great dipping oil. 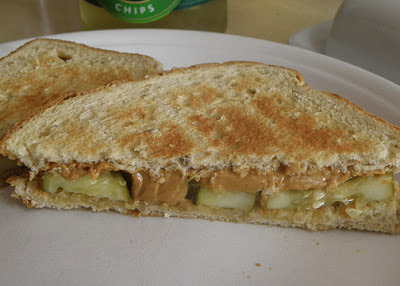 All of the flavors are wonderful for dipping with bread,' Sarah Botham said." "It has superior cooking qualities, (UW-Madison animal science professor) Cook said." Sarah Botham certainly won't disagree. "These oils," she said with a smile, "are something special." 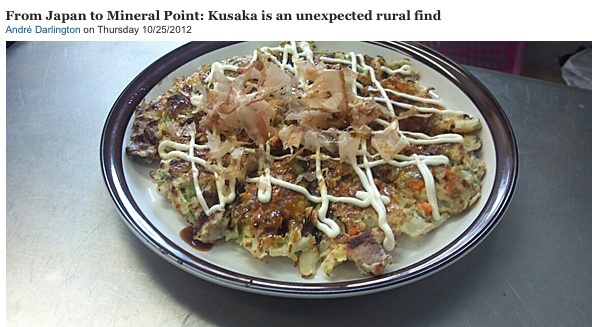 Next up....Kusaka Restaurant in Mineral Point. Hiroko and Chris wonderful food entrepreneurs and really delightful people. "Hiroko and Chris met in Sendai City, Japan, where Chris was teaching English and Hiroko was a cook in a hospital. She's a professionally trained chef, and together they opened a coffee shop... Then in 2011 came the tsunami — and the subsequent nuclear fallout." "Chris' mother lives in Dodgeville, and the two decamped to Wisconsin and moved in with her. Shortly after, they got an offer to take over a vacant space in Mineral Point, and Kusaka was born in July of this year." "To put things into perspective, you should know that all the ramen noodles in New York City come from just three factories." "Hiroko and Chris Messer are making their own handmade ramen noodles at their restaurant, Kusaka, in Mineral Point. And they're not using a pasta machine, as is conventional for the DIY crowd. This is hand-kneaded, hand-rolled and hand-cut." "For now, the very gregarious and efficient Chris is host, waiter and kitchen helper, while Hiroko is chef. The couple have begun to hire some help, and as word spreads, they're going to need it." Congratulations to our Iowa County food entrepreneurs! Botham Vineyards banks on cottonseed cooking oil. Wisconsin State Journal. Oct. 28, 2012. Written by by Rob Schultz. From Japan to Mineral Point: Kusaka is an unexpected rural find. Isthmus. Oct. 25, 2012. Written by Andre Darlington. Visit Iowa County Wisconsin Lodging, restaurants. Culture, arts. Artisan food and farms. Iowa County Area Economic Development, where I work. Food Enterprise Center Grand Opening. Congratulations Sue and Vernon County, Wisconsin! 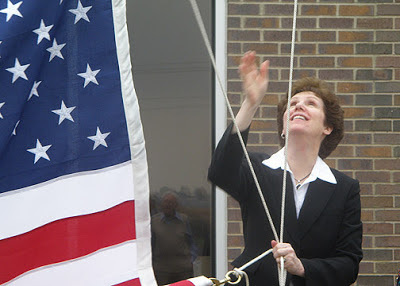 What a wonderful day for Vernon County, Wisconsin and the world! My friend Sue Noble is a great economic developer. Yesterday Sue and a zillion friends including me celebrated the Grand Opening of their Food Enterprise Center in Viroqua. This building was a manufacturing plant and a hub for good regional jobs for decades. When the owners shut the plant down Sue and her team acted boldly. Sue focused on food as economic development. In doing so she converted a problem into a world class asset. Best of all though, is that Sue dedicated the re-opening of this facility to the men and women who lost their livelihoods when the former plant shut down. Many were with us at the celebration today. Congratulations Sue and to everyone involved with today's Grand Opening of the Food Enterprise Center! There are no higher honors for small business owners than long term, sustainable success and the earned loyalty of the people they employ and support. Mary and I recently got the chance to eat breakfast at Jack's Restaurant in Skokie, IL. Check out the years of service their employees have been with them. Jack's has provided 94 years of combined employment for the owners Jack and George. 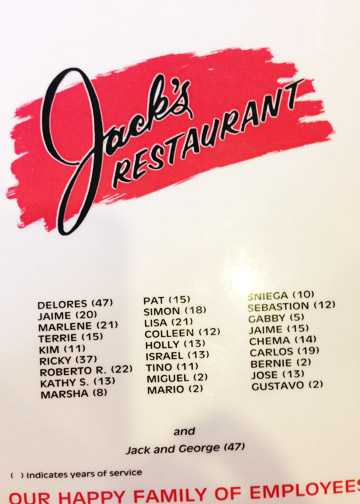 Jack's has provided 393 years of combined total employment for their employees. That's a combined total of 487 years of sustainable work. At this writing Jack's has likely created more than 500 years worth of good local jobs. Imagine if you could include all the many years worth of total jobs for people who worked there in the past. Remarkable. Congratulations to the entire family at Jack's! Make your life safer. No slip floors. Inside and outside. I usually don't recommend individual businesses but I'm going to start ignoring that. I had lunch this week with an old friend and former client who is a really cool specialty contractor. Mark provides a valuable service that few of us ever stop to consider. 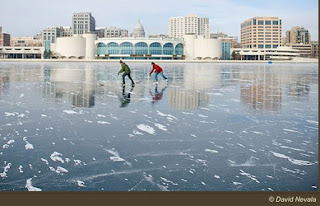 My friend Mark Wilcox owns Wisconsin No Slip Floors. His firm offers treatments for most any surface - inside and outside - making it safer and even more beautiful. You don't have to put up with slippery, dangerous floors at home or at work. Mark can make homes much safer - floors, tubs, showers, decks, and pools. At work, Wisconsin No Slip Floors can treat most floors to increase safety and decrease risk. We did our tub floor and it made an immediate difference. It makes sense to invest in prevention rather than paying for injuries and time off work. This would make an especially great gift for an older person in your life. Mark at Wisconsin No Slip Floors is a craftsman and a great resource for people wanting to increase their safety at home and at work. He's also got some great no-slip products you can order and apply on your own. Mark's base is in Southeast Wisconsin. His territory is typically all of Wisconsin and Northern Illinois but I'm sure you could coax him further with a great job. No guarantee, but if you mention promotion code 'Rick', Mark will probably split his McDonald's cookies with you. This year, give yourself and your family the gift of safety. Wisconsin No Slip Floors.